Fashion and technology are having a moment, and we're not the only ones who've noticed. Museums, those vaults of history and society, are clearly paying attention to the impact of technology on fashion. Late last autumn, the Metropolitan Museum of Art in New York announced the theme for this year's MET Gala and exhibition will be "Manus x Machina: Fashion in an Age of Technology." Around the same time, the high museum of Atlanta launched its exhibit on Dutch Designer Iris Van Herpen while earlier in March, the museum of Fine Arts in Boston opened the doors to #TextStyle, an exhibit exploring the relationship between digital and design when it comes to fashion. Visitors to #TechStyle, which is on display in the MFA Boston's Henry and Lois Foster Gallery, can expect to get a glimpse into the future of wearable technology beyond the wrist, including dresses that move with a mind of their own, clothing that reacts to noise and music and garments that comes out of a 3D printer ready to wear. The #TechStyle exhibit aims to explore the relationship between fashion and technology, and how digital innovations are changing not only the way we produce and consume fashion, but also the way fashion functions in our daily lives. "We're always trying to make acquisitions for the museum's permanent collection that represents what is happening at the moment," says Michelle Finamore, curator of 20th and 21st century fashion arts at MFA Boston. "Right now, there's a very exciting synergy between fashion and technology, which made for a wonderful subject to explore in an exhibition." The showcase includes 60 art pieces from 33 designers who range from well-recognised to emerging, including five commissions created specifically for the museum's collection. Highlights include a digitally-printed dress from Alexander McQueen's Plato's Atlantis collection (Spring/Summer 2010/2011) and a leather jacket from Lauren Bowker's Air Collection that changes colour in response to different environmental conditions. The centrepiece of the exhibition (and the signature image for the show) is Dutch designer Iris Van Herpen's Anthazoa Dress, a 3D printed collaboration with architect Neri Oxman. The dress, which debuted at Paris Fashion Week in spring 2013, was produced using Stratasys' unique Objet Connex multi-material 3D printing technology, which allows for a variety of material properties to be printed at once. "This dress captures not only a moment in fashion history, but also this amazing collaborative effort that's happening right now between the fashion and the tech worlds," says Finamore. In addition to garments that highlight the structural complexity allowed for with new technologies, the exhibit also features a number of interactive pieces. Canadian-born designer Ying Gao's Incertitudes is a set of sound-reactive outfits embellished with sewing pins and electronic components. Both dresses are activated by a speaker's voice, which brings motion to the pins, giving the dress a sense of presence. The MFA Boston also commissioned a special version of the wearable couture company CuteCircuit's Twitter dress, originally created for the mobile network operator EE to mark the launch of the company's 4G network. The CuteCircuit MFA Dress is a flapper-inspired evening gown made from CuteCircuit's signature magic fabric and Swarovski crystals on rose gold and silver-plated chains. "Our magic fabric includes 11,000 micro-LEDs which bring the dress to life with animations and tweets," says Francesca Rosella, Creative Director of CuteCircuit. The dress's display is accompanied by an iPad, which invites museum attendees to step up and choose from a library of custom-made animations of masterpieces from the museum's collection. "We wanted to help create a dialogue between art through the centuries and what can happen in the future" says Rosella. Four other commissions were created by Hussein Chalayan, Dr Kate Goldsworthy, Francis Bitonti and Nervous System, a Massachusetts-based generative design studio. If museums are supposed to provide a curated look at culture, then it's clear there's enough happening at the intersection of fashion and technology to warrant whole exhibitions. 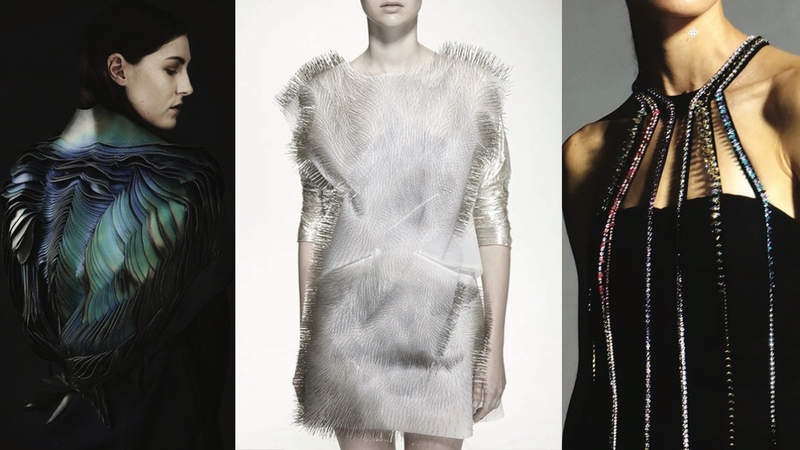 Connected clothing – that is, clothing that includes electronic elements and digital systems – is poised to augment our bodies and enable new forms of communication. While clothing has always signalled mood, style and class, the next generation of technical textiles will allow us to express ourselves in ways never before imagined. #TechStyle is on display at the Museum of Fine Arts in Boston from now until 10 July 2016.